Though I am 1/4 Mexican (paternal grandmother~Zacatecas, Mexico), I have never really celebrated Cinco de Mayo. Of course, since I've had a blog, I celebrate many holidays by way of sweets:) In this case, I made cookies, Mexican blanket (or rug:)) cookies to be exact. I love the vivid colors that are used in many art forms and crafts within the Mexican culture, and wanted to incorporate that cheerful element in these celebratory cookies. Once again, the cookie painting was done with Wilton food paste colors. I still haven't ventured from a safe, basic striped pattern in my cookie painting:) I think I need to muster up some courage to step out of my comfort zone. The worst that can happen is that we eat the rejects, right? The base coat on the cookies is simply a flat layer of white royal icing, and the cookies themselves are sugar cookies. A #3 tip was used to outline the cookies, and to add the fringe detail. Aside from the trim, The entire cookies were painted with Wilton concentrated pastes. 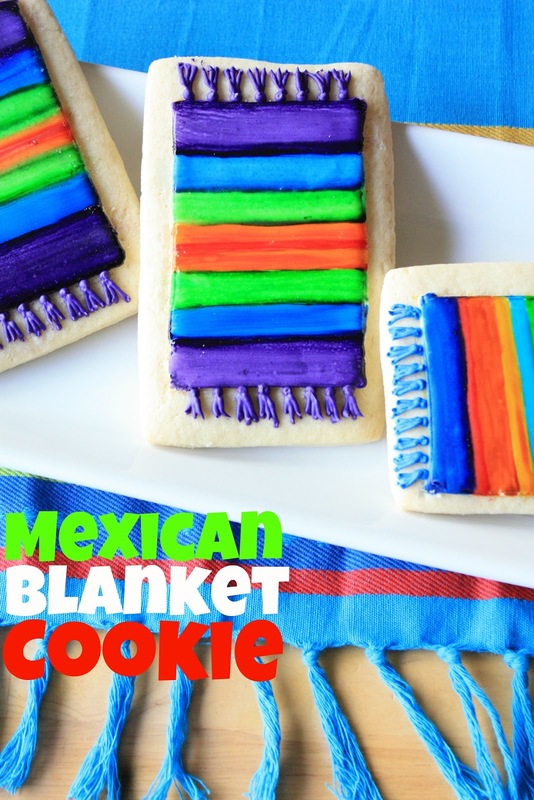 I had a great time painting these Mexican blanket cookies and using all the bright colors! If you haven't tried painting cookies yet, you should try it! Have a Feliz Cinco de Mayo mis amigos! What a fabulous cookie idea for Cinco de Mayo. I love your blankets and the gorgeous colours. You've sold me on the idea of painting cookies. The colors are so amazing! Do you have to dilute the food coloring at all? These are so festive! I ove the colors and I have to try painting cookies soon. Sue these are great. So colourful. They look great painted. I'm excited to give that a try when I'm more confident with cookie decorating! These are freakin' adorable. Seriously adorable! I wanted to reply in spanish, but all I know how to say is Merry Christmas and Happy New Year! These are fantastic! So so very pretty!! Great job painting and I love the tassels! Beautiful! Love them, they turned out perfect! How cute are those! I don't think the straight stripe looks too "safe" to me - looks hard. Wish we were neighbors and I could come over and paint and decorate cookies with you. You are always too much fun! Such a fun idea for Cinco de Mayo. I agree with Jacqueline I'd love to decorate cookies with you one day. Happy Cinco de Mayo! These cookies are so cute! You're so creative! Your cookies are so cool and colorful! Aabsolutely perfect for cinco de Mayo! Thank you for sharing this idea. This is my first visit to your blog. You are more outside of your zone than I am! It gives me inspiration to get started with my favorite things to do with my gran-munchkins. Looking forward to more visits here. As usual, your cookies are just darling. I don't think I have the patience to paint cookies, but I love seeing what you do with it. And thanks for sharing your heritage with us. So interesting! Wow, at first I thought the cookies were real, that must mean that you did a great job! OLE'!! I could curl up and snuggle w/ THAT blanket! HA! Sue, I must say that whenever I visit your blog, I'm always very impressed with all innovative creations! These cookies are so cute. You are such a cookie talent! I don't even want to think about how hard it was to make those little tassels look so perfect. You are an Artiste!! So perfect! I'd love for you to add it on my link party at: http://printabelle.com/?p=3188 Thanks! OH...love those blankets!! What a neat way to decorate!!! Great job!!! You are a true cookie genius. Awesome colors, they look so festive. I love how fun these cookies are! You are so talented!! !